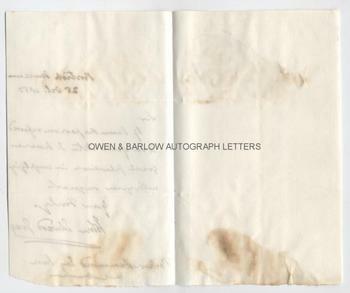 JOHN EDWARD GRAY autograph Letter Signed. British (English) zoologist, museum curator and the world's first known stamp collector. ALS. 1p plus integral blank leaf. British Museum. 25th October 1850. To W. Parker-Hammond, Esq., Jun. 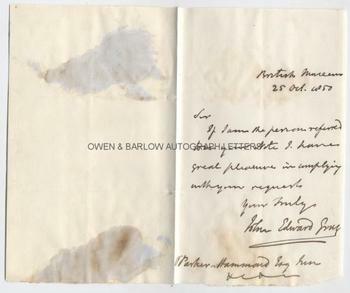 "If I am the person referred to in your note, I have great pleasure in replying to your request." 8vo. Approx 7.25 x 4.5 inches. Mounting residue to the verso of the integral blank leaf and some browning from the glue that was originally used to affix it in an album. Slight chip to lower right corner, not affecting text. All else very good. 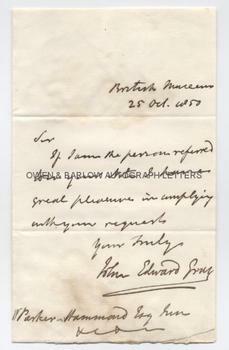 John Edward Gray was an eminent zoologist who was keeper of the Zoology department at the British Museum from 1840 to 1874. He oversaw the formation and transfer of holdings to the Natural History Museum and he was the founder of the Royal Entomological Society in 1833. Several new species were named after him. He had a keen interest in postage stamps and, when the first penny blacks went on sale on 1st May 1840, he purchased several with the sole intention of preserving them for posterity, thus making him the world's first known stamp collector.